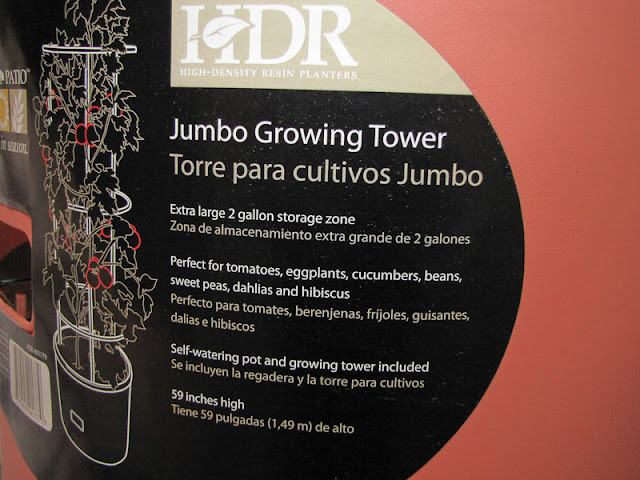 I was shopping at Manhattan's 23rd St HD when I came across this planter, the Jumbo Growing Tower from the HDR line of Southern Patio. This is the first self watering container I've ever seen sold in this store. 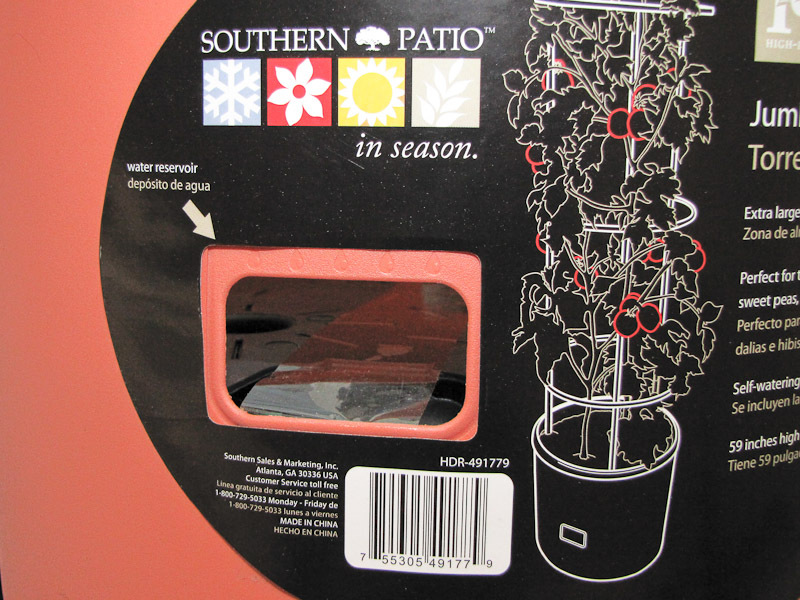 I bought one for the roof, $15.98 plus tax. 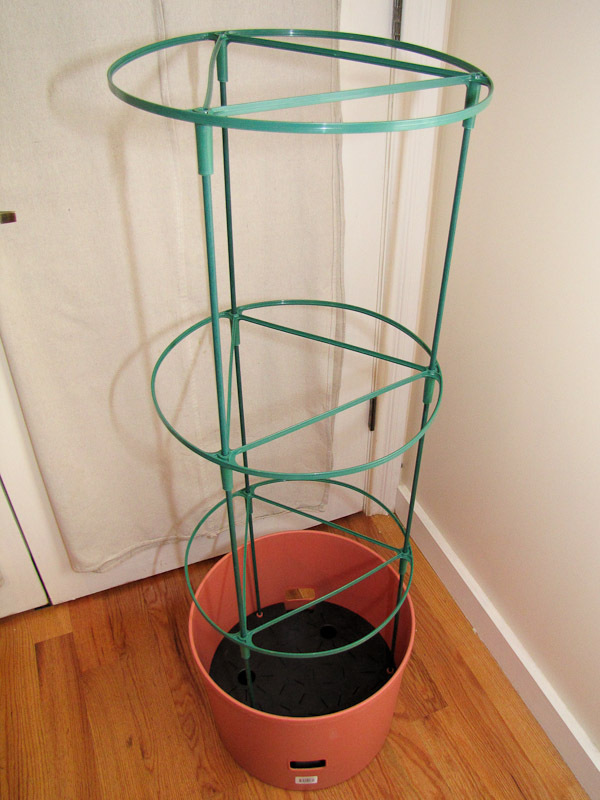 The planter is 15 inches wide and 12 inches tall. The soil chamber is 8 inches deep and the water reservoir is 4 inches deep. 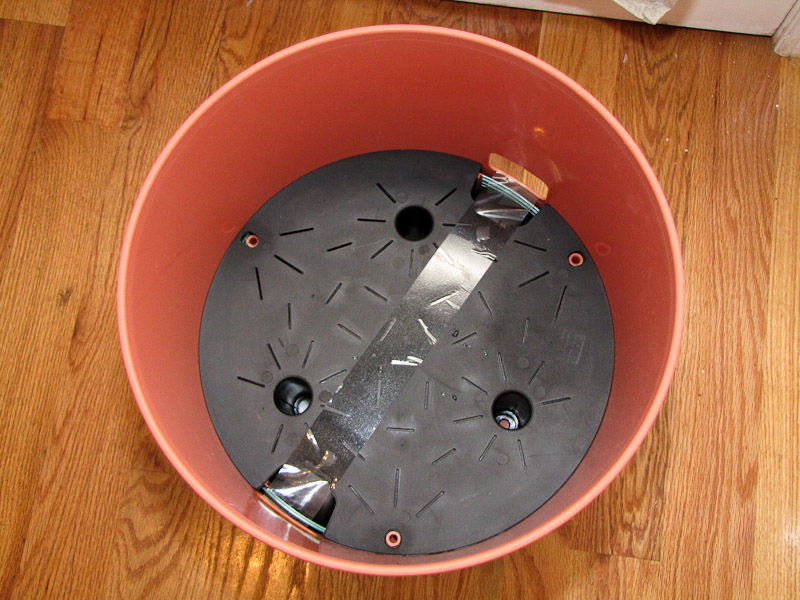 Remove the black divider and you see the caging kit stored in the bottom of the container. The label says the planter with the cage reaches 59 inches, but I measured only 45 inches. It would reach 59 inches, however, if a 4th ring and set of risers were included in the package. I assume at some point the company changed their mind and reduced it to a set of three and never bothered to correct the label. Either that or I got an incomplete kit. I don't care enough to pursue the issue, but if someone else buys this planter and they get a 4th ring and set of risers please let me know so I can update this post. The label also states the water reservoir holds 2 gallons of water, but I was able to fill it to a little over 2.25 gallons. 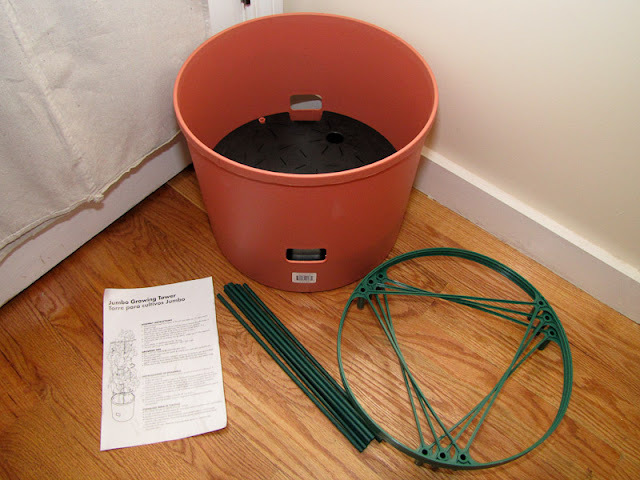 The planter and the green sticks for the cage are made from a hard plastic. 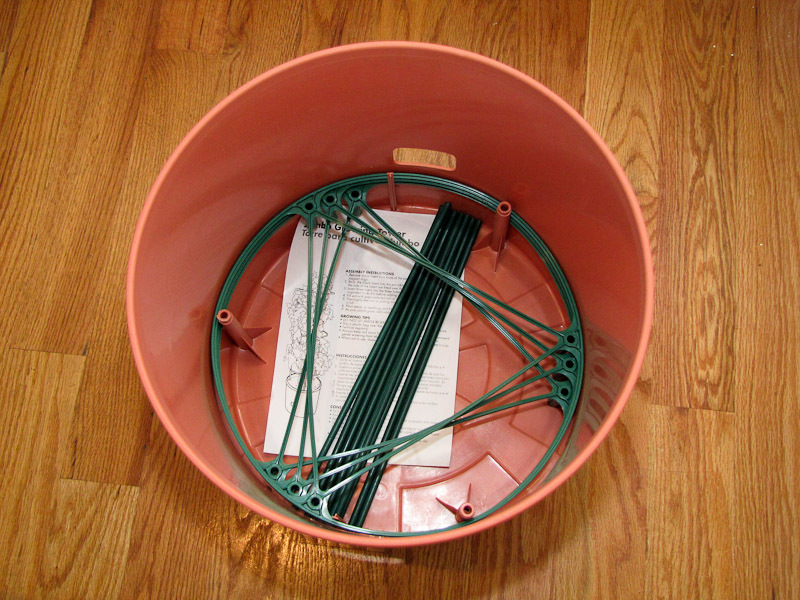 The black divider and green rings of the cage are made from a softer, bendable plastic. Does this matter? Time and the elements will tell. I'll let you know how it does on the roof. Update: My thoughts after five years of use. As I suspected all the hard plastic parts have held up well and the soft plastic parts have had a tougher time. One of the green rings has a broken arm and a small section of the black divider broke off when I got a little too aggressive with a garden spade, but both of these things were easily fixed with some duct tape. The support cage cannot support anything heavy, I use it only to keep leafy growth in check. 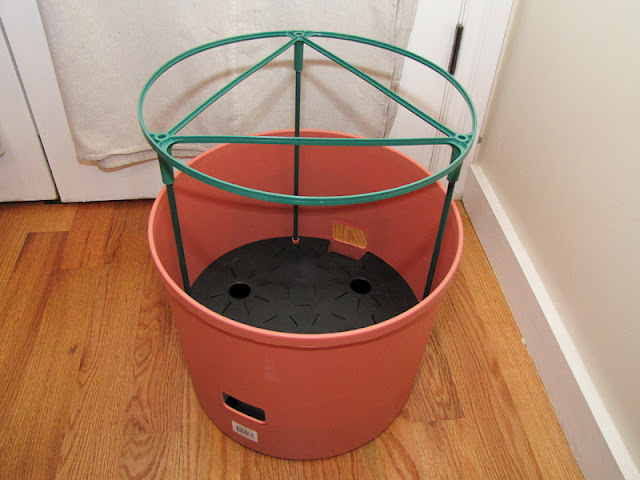 Don't rely on it to support a tomato plant. The support cage struggles in high wind conditions. The sticks and rings fit together well, but they do not lock into place. If all 3 tiers of the support tower were used and it was a windy day the tower would sway so much a few of the sticks would often come loose from the rings and fall to the ground. More of an annoyance than anything else. I don't regret buying it. I wouldn't buy another one for myself, but I would recommend it to someone thinking about getting into gardening. It's a good entry level product. Price is not bad but 2 gallons is not enough if you're planning on indeterminate tomatoes unless you fill it daily during summer. 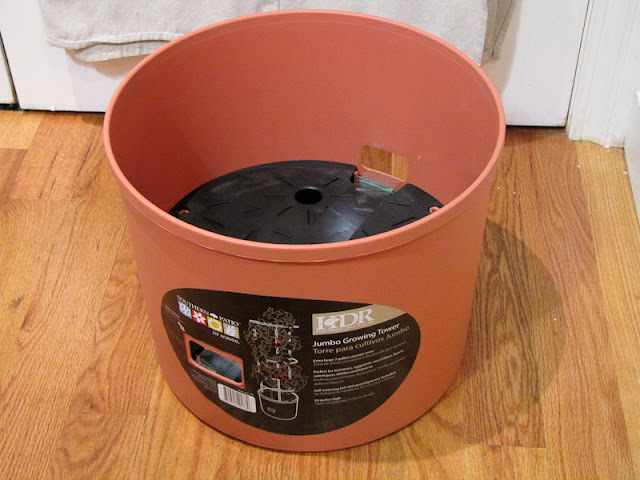 Even the 3 gallon earthbox does not hold enough water for indeterminates. Hi William, I agree, indeterminate tomatoes in containers are -very- hard to keep watered in the summer. 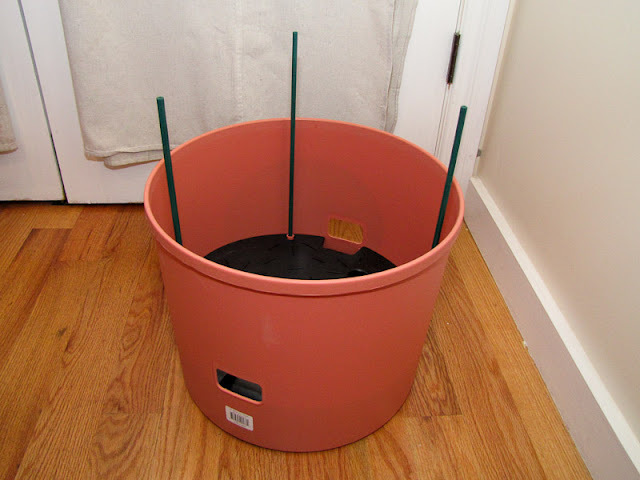 Off hand, I can't think of any commercial self watering container that can last more than one day without needing to be refilled. A DIY container from a tote with a very large water reservoir would be needed. Oh, I like the new Self Watering Container. And that it has it's own cage, very cool! Hi Mimi, the caging kit is what convinced me to give it a try. To get both a container and a cage at this price got my attention. i bought 3 of these recently, and they all had only 3 risers, same as you, all of the instructions say 4. I have some cherry tomatoes growing in one, and it seems to be doing well. Just planted some squash in another. And with the 3rd, one of the holes/holders that holds the rods came broken, so I'm just using this pot for herbs and arugula.